The time I realized I wanted to time travel thanks to Marty McFly, Doc Brown, and a flying DeLorean. The time I think I *actually* time traveled back into the 13th century kingdom of Lanna at the Dhara Dhevi Chiang Mai. Ok, so I didn’t actually hop inside the DeLorean, throw on the flux capacitor to generate 1.21 gigawatts, and floor it to 88mph to get here; but it sure felt like I did! 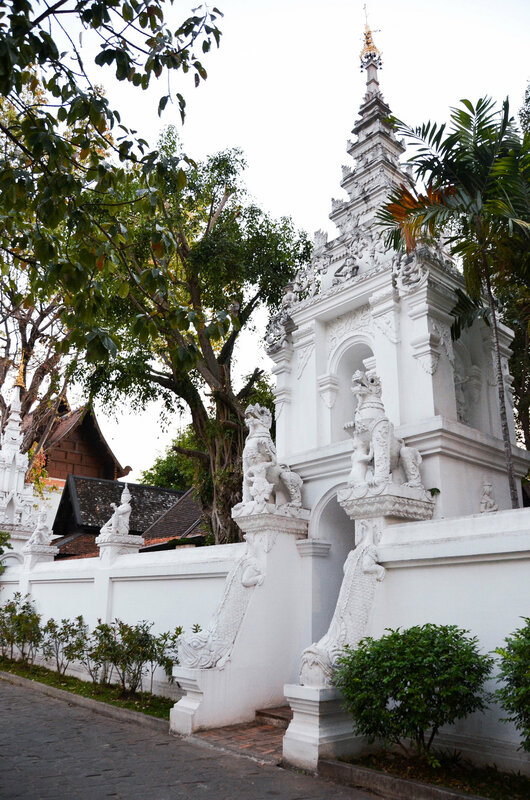 From the moment our car pulled up to the front gates of Dhara Dhevi in Chiang Mai, all it took was one look up the long, stone driveway through the tall, wooden gates for my mouth to drop in awe. For a girl who normally can’t stop talking, I found myself absolutely speechless for the first time while staring up at the abundance of beauty that was in front of me. I kept asking Jay to pinch me to see if what was in front of us was actually real. Had we just stepped back in time to the Lanna Kingdom of the 13th century, or was this just one of the most remarkable architectural properties we’d ever seen? What exactly is the Lanna Kingdom? Before Thailand was the country that we know it to be today, it used to be quite different in terms of culture and size. 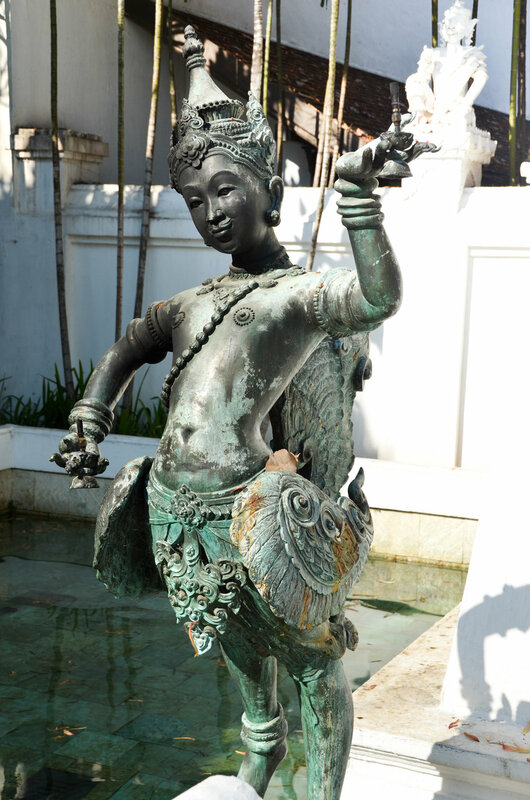 Two main cultures—the Siamese and the Lanna—dominated the region for centuries. The Lanna had hold in the northern region, and the Siamese had hold in the southern. The two kingdoms eventually unified after the kingdom of Lanna was faced with repeated invasions and wars and was forced to turn to the kingdom of Siam for aide. They merged together to form what we now know as Thailand! Despite this historic merging of cultures, the northern part of Thailand has still managed to maintain its identity in a number of ways—which is probably why you’ll often times hear Chiang Mai being referred to as “Thailand’s Culture Capital.” The food is different (HELLO, DANGEROUSLY SPICY), the architecture is different, and even some of the language can be different. For those of you who live in the US, it’s similar to comparing the culture and lifestyles of a place like Philadelphia to a place like New Orleans. Bravo to you for finishing that mini history lesson of the day on Thailand! I’m not joking when I say that you are literally transported back in time from the minute your car turns onto the property grounds. As you enter the hotel, you cross over a noisy, rickety bridge that makes a sound as if your car might break the wood beams that are holding the bridge together. We learned that this was actually customary in palaces and kingdoms of the time period because the noisy sound of the bridge would essentially work as an alarm system for the guards who were standing watch to let them know that someone was arriving. They even have an actual watchtower near the entrance that is a replica of what would have been used! As you drive up the authentic stone driveway that leads to the main building on the exotic 60-acre estate, you’re instantly surrounded by some of the most spectacular architectural designs and features that you might have seen around a traditional 13th century Lanna Kingdom. You have everything from grand marble entrances to intricately decorated doorways and multi-tiered rooftops. You’ll see architectural inspiration from Laos, Myanmar, China, and of course traditional Lanna style, just to name a few. The only thing that we were able to effectively express after our mouths had been wide open for about 15 minutes was just how incredible every tiny attention to detail was. From the gilded dragons to the carved sculptures, from the exotic horticulture to the traditional rice paddies; every single nook and cranny of this resort seemed to have a purpose and meaning behind it. No detail was left unnoticed. It’s hard to not feel like you’re royalty by staying somewhere that pays this much attention and care to the guest’s experience. After briefly recovering from our sensory overload (and pinching ourselves saying, “YES, this is real life.”), we sipped down our tasty welcome drinks and cooled down with a refreshing washcloth that the concierge provided. The staff graciously gave us some information about what we can expect to see, eat, and do throughout our stay, and sent us with our butler to our suite via golf cart (BTW I just love when hotels do this!). Needless to say, we were ready to start exploring the property! The designers and engineers of Dhara Dhevi have essentially created a miniature version of a traditional Lanna-style village among the 60 acres of lush, tropical land. When I say that you actually never have to leave the property during your stay, I mean it (we really didn’t...). There are houses, villas, apartment residences, suites, and even penthouses secretly tucked away all around the grand estate. Some rooms come equipped with their own private pools, terraces, or even additional living spaces and kitchens. Keeping similar to the rest of the hotel aesthetic, not one single detail was missed. Among the 123 spacious accommodations throughout the property, you have two distinct styles of rooms, villas, and suites. There are the more traditional Lanna-style buildings that are built from teak wood and follow a common Northern Thai design aesthetic, and then there are the colonial style residences that adhere to a more modern style of luxury (which is where we stayed). I can assure you though; you really can’t go wrong with either choice. Our room was in the Colonial Wing of the hotel, which I thought was a fun experience since it’s the most modern and “urban” style of accommodations that the resort has to offer (perfect for The CITY Sidewalks). 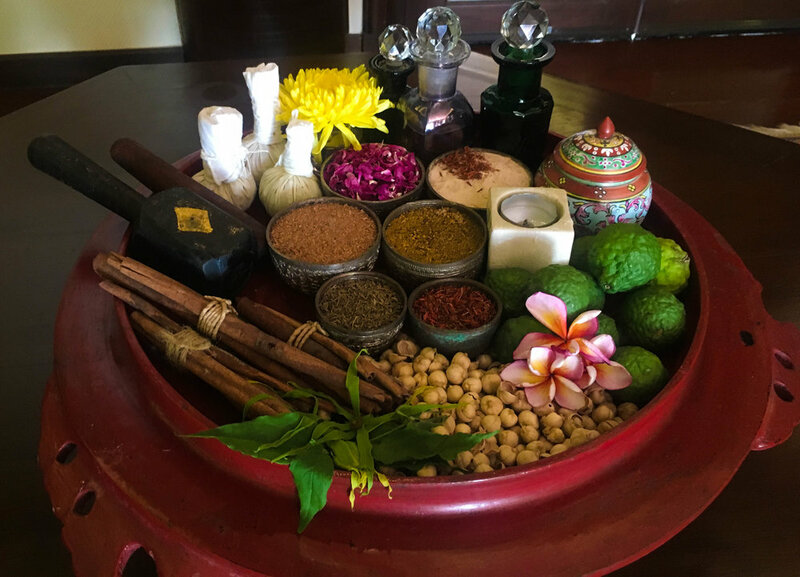 Even though it’s not the traditional Lanna-style of the other villas and houses, you still get a really authentic experience that transports you to a different era, which is exactly what we were looking for. The style of the decor, architecture of the buildings, and even the intricate carvings of the wood details all pulled together to create this truly unique feeling of being lost in a colonial village of another time in Asia. 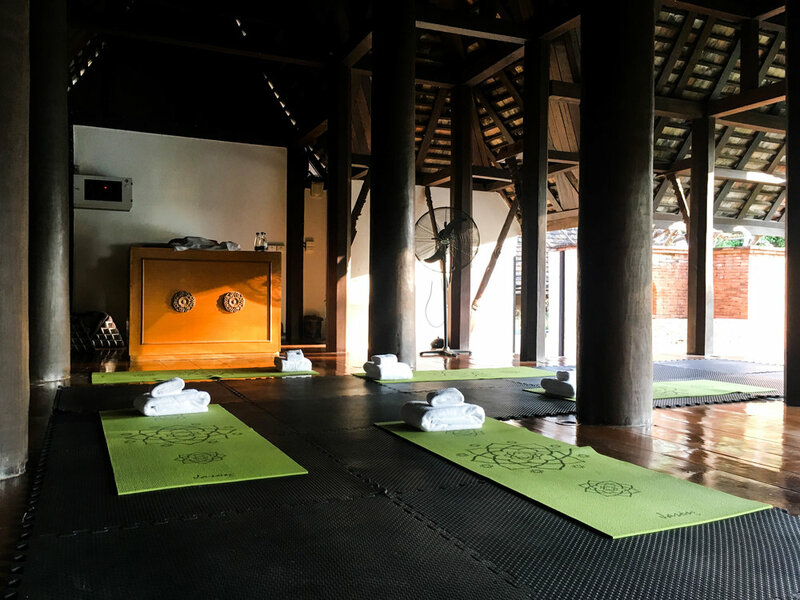 Although we didn’t stay in the traditional Lanna-style villas or houses, we were lucky enough to get a quick peek inside one of them to see what they offer. These villas, houses, and suites on the other end of the resort are truly magnificent. 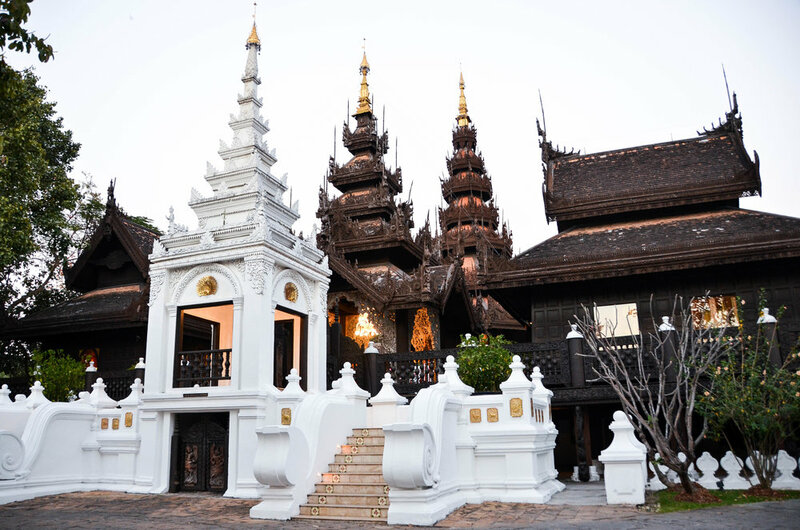 Each one is incredibly spacious and follows a very unique design aesthetic that is true to the time period and culture of the old Lanna Kingdom. Some of the villas even come with their own swimming pools (sometimes more than just one), outdoor showers, gardens, kitchens, family rooms, dining rooms, and terraces. They are truly fit for royalty! It’s time for some honest truth here... We budgeted 4 nights total in Chiang Mai, 2 of which were spent here at Dhara Dhevi. 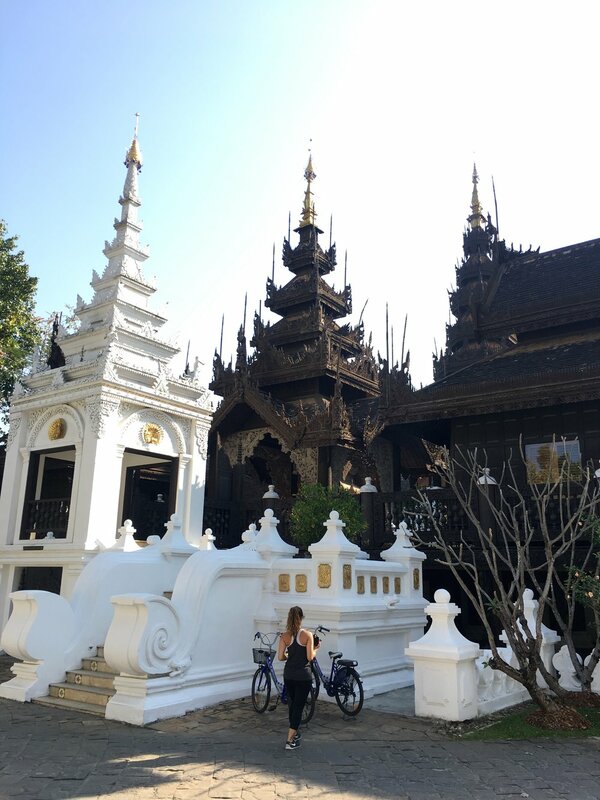 We left Chiang Mai feeling like we hadn’t even scratched the surface of things to do and explore in the actual city. Want to know why? We literally never left Dhara Dhevi on the days that we spent here. I’m serious. 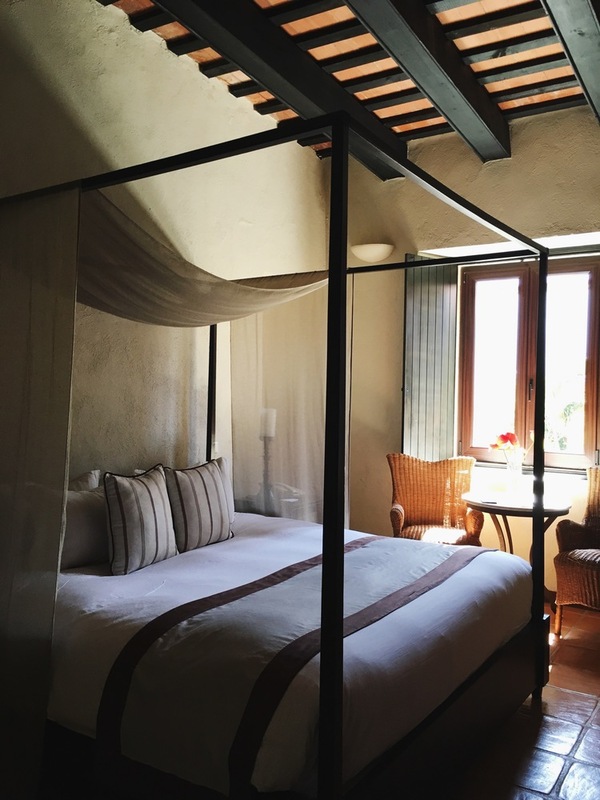 This hotel really has SO MANY things that you can do, eat, explore, and experience that you actually never have to leave—which is exactly what I’d recommend doing. Soak in everything that this resort has to offer because it is truly a once in a lifetime experience that will leave you wanting more. This was by far one of my favorite things to do at Dhara Dhevi! You can rent a bike at the fitness center for the day so you have a quick and easy way to get around the property. 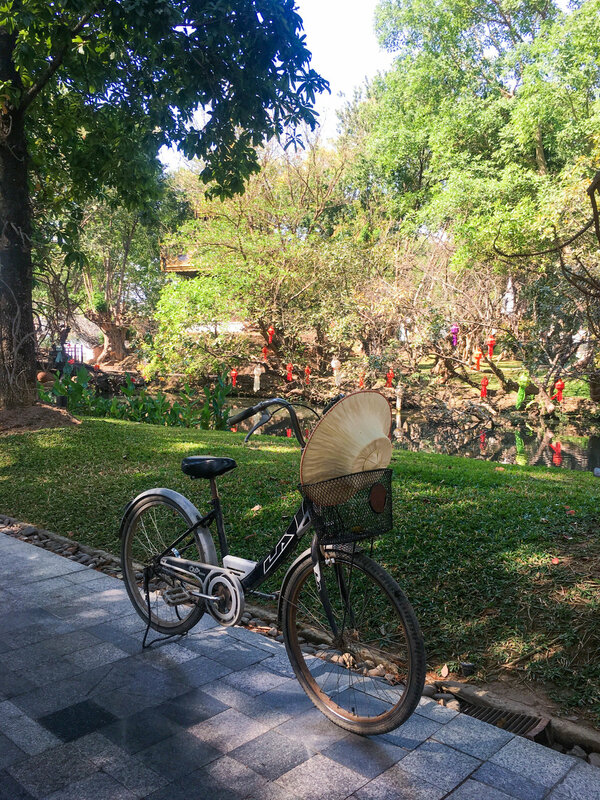 Jay and I did this for one day and it was really fun to weave around the winding paths of the grounds to explore everything that the hotel had to offer. It’s hard not to spend all day just riding around on the bikes to admire the architectural beauties of the hotel. I’m not exaggerating when I say it’s truly breathtaking. I say “spend time at the spa” because even if you don’t have an appointment for a treatment, you should still come to see it. The spa at Dhara Dhevi is world renowned for its services and treatments. 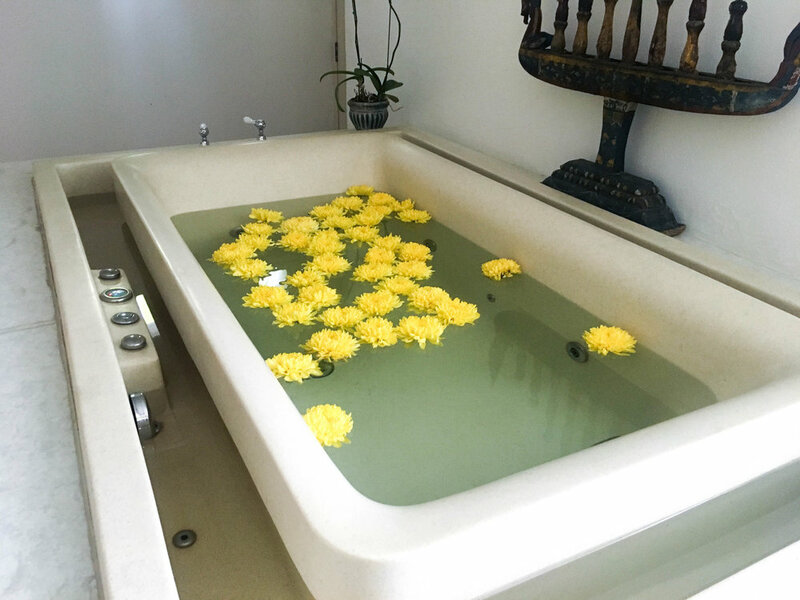 Not only do they specialize in various forms of holistic healings and relaxation therapies, but they also boast one of the most spectacular buildings on the entire property. Just one look at the palatial center (which is over 3000 square meters) and its impeccably designed moldings and embellishments will leave you speechless. The entire building took over 3.5 years to complete! So as I was saying... By all means, sign up to get a treatment if you can. But if you can’t, don’t miss stopping by to admire this architectural marvel. If you’re interested in learning how to cook some authentic Thai cuisine, make sure to sign up for the cooking lessons that they offer on site! This was something we didn’t have time for, but hope to do upon our return. Another area of the resort that you must come to have a look. 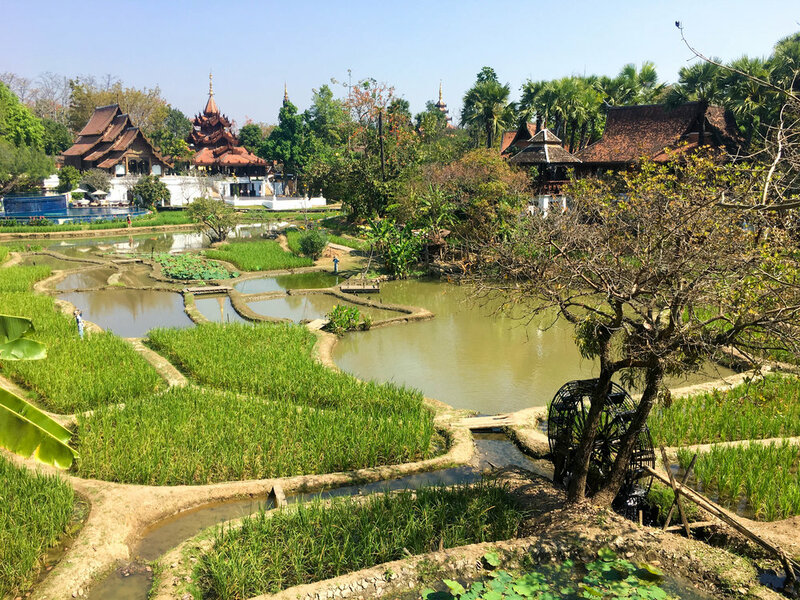 The rice paddies are a graceful nod to the old, traditional rice farming that would have been done in a community or village like the one they’ve recreated. They even offer activities for kids and families so you can come and plant some rice during your stay! There are tons of daily activities always happening right on the resort (another excuse to never leave), and one of my favorites was morning yoga just above the fitness center. You can stop at the concierge to see what kinds of things they have planned during your stay! Even if you don’t eat on site, you absolutely cannot miss the nightly dance performances at Le Grand Lanna. It is a really special part of experiencing Thai culture and I highly recommend going at least once. We went and had a cocktail at the bar while we enjoyed the show! Something truly magical happens at dawn and dusk here at Dhara Dhevi. It’s almost as if the resort, the sun, and the skies have a prearranged agreement to just make everything look even more stunning than it already is. I’m telling you, this property absolutely GLOWS at sunrise and sunset. The rooftops stand out against the warm sky backdrop, and the lights around the buildings seem to actually sparkle. It’s also the best time for photos in my opinion! So cozy up on your balcony or terrace—or maybe even get reservations at one of the restaurants on site—and enjoy the sunrise and sunset. They do not disappoint! The cuisine choices at Dhara Dhevi will not disappoint even the pickiest of eaters. There are more than half a dozen food options that you can choose from, and even a few different bars to have a drink or appetizer! Akaligo (International): This is where they serve the breakfast and brunch menus. We were overwhelmed by how many tasty things were available for us to indulge. Honestly, I don’t think I’ve ever seen such an incredible brunch spread in my life—and I live in the city that loves to brunch! They have your traditional eggs, meats, cheeses, pastries, etc., but they also have Chinese and Japanese style breakfast, a fresh squeezed juice station, a ramen station, salads, pastas, specialty meats, and so much more! Rest assured, you will not have a problem finding something to eat at breakfast. They even do Sunday Jazz Brunch if you’re into having a little “vibes” on the side of your meal. Farang Ses (French): AKA the single best French meal I’ve ever had in my life. How is that possible when I’m in Thailand? I don’t know, but I’m not complaining about it. If you pick one place to splurge a little while you’re at Dhara Dhevi, I would 100% recommend coming here. Every dish we had was worthy of licking the plate afterwards. It was that good. PS: The restaurant's building and interior decor is not one to miss either! Le Grand Lanna (Thai): You’re in Thailand, which means you need to eat authentic Thai food. At Le Grand Lanna, you can try both Classic and Northern Thai dishes. Be aware that Northern Thai dishes are much, much spicier than most westerners are used to. Just a word to the wise! Make sure to go here in the evenings so you can catch the traditional Thai dance performance as well! It's really beautiful! Fujian (Chinese): If you’re craving some Cantonese or Contemporary Chinese food, this is your place. It’s located within the Kad Dhara Shopping Village, so you can even do a little shopping if you have time! Allegro (Italian): This place is great for foodies looking to indulge in a hearty meal in a lively atmosphere. 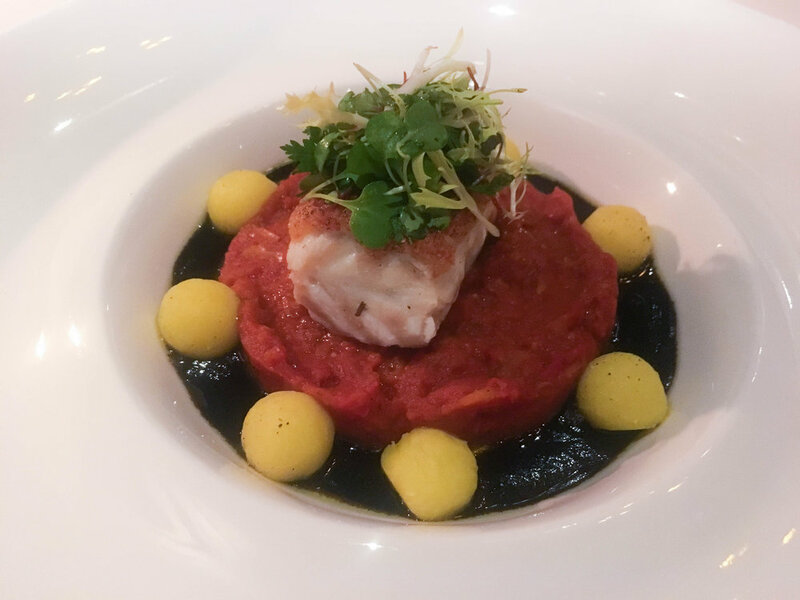 Allegro’s traditional Italian cuisine is a perfect option for families or larger parties who want to share classic, rustic dishes without having to travel into the downtown area. 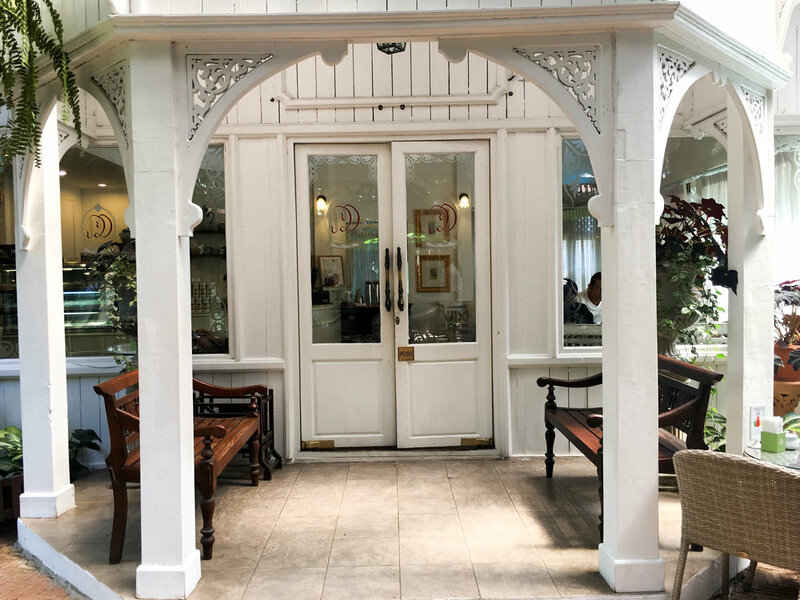 Dhara Dhevi Cake Shop (Victorian-Style Tea Salon): Your dining and culinary experience on site is absolutely incomplete without a stop at the Dhara Dhevi Cake Shop. The sweet treats and decadent dishes at the Cake Shop will make you believe in “second stomachs for dessert.” You can have your treats at the shop, or take them to go if you want to indulge back in the room. If you have a major sweet tooth like I do, make sure to check out when they have the weekend dessert buffet set up. 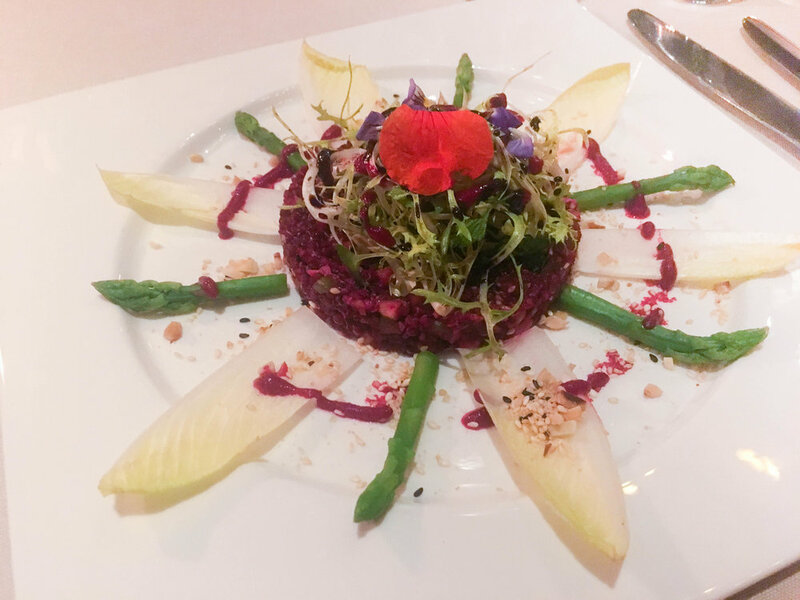 Other Dining Options: In addition to all these incredible restaurant choices, the resort offers guests the option for private dining services or parties. Obviously, you can have your choice of standard room service, but you can also pack a picnic to eat somewhere around the hotel, have an in-villa barbecue prepared, enjoy a traditional Afternoon Tea, or even arrange a private (candlelit?) dinner in your suite or villa. Bars and Pool Service: Make sure to check out the trendy Horn Bar, which is located in the lobby adjacent to the reception. I’d also recommend lounging by both of the main pools and ordering poolside service. Like I said before, be aware that Northern Thai food is much spicier than most western cultures are accustomed to. We felt so bad that we tried a dish by the pool and had to request that they make another one with absolutely no spice because it was too rough to handle! 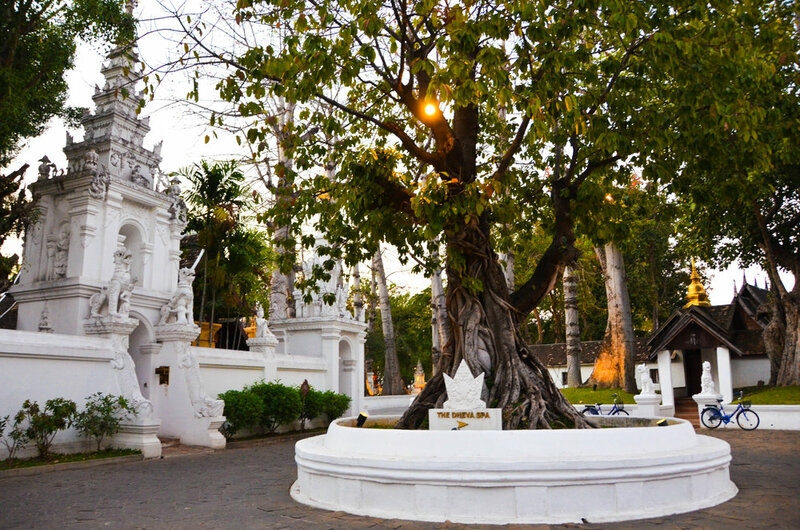 When you’re planning your trip to Chiang Mai, I would factor in the time you’ll want to spend on the grounds at Dhara Dhevi separately from the time you’ll want to spend in the downtown area of Chiang Mai. You can totally do both; but I promise, once you experience the world-class services and amenities that Dhara Dhevi has to offer, you’re going to wish you had just experienced the resort on its own and never left. The resort isn’t really a single’s scene and is best for couples, small groups, or families. 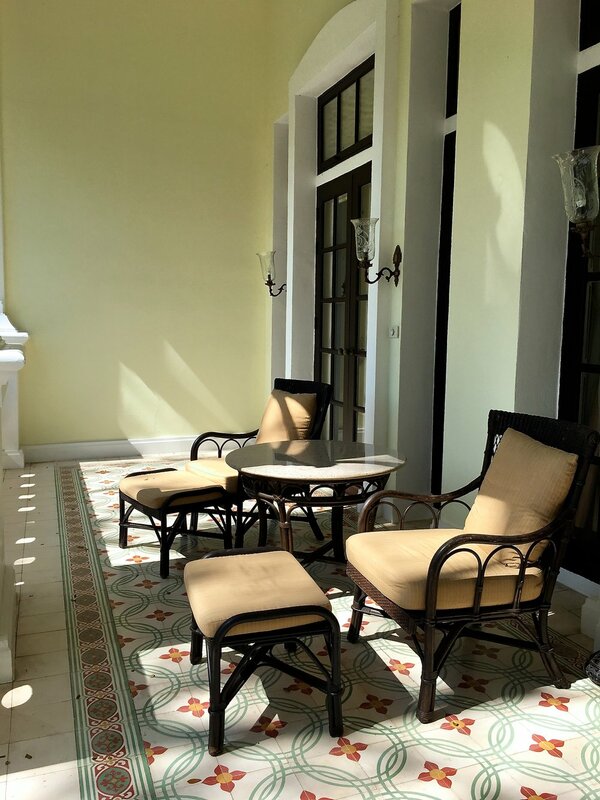 It’s an ideal place for a relaxing, secluded getaway in the heart of Chiang Mai. It’s conveniently located just about a 15-minute drive from the main Chiang Mai airport, which you can reserve pickups to and from. 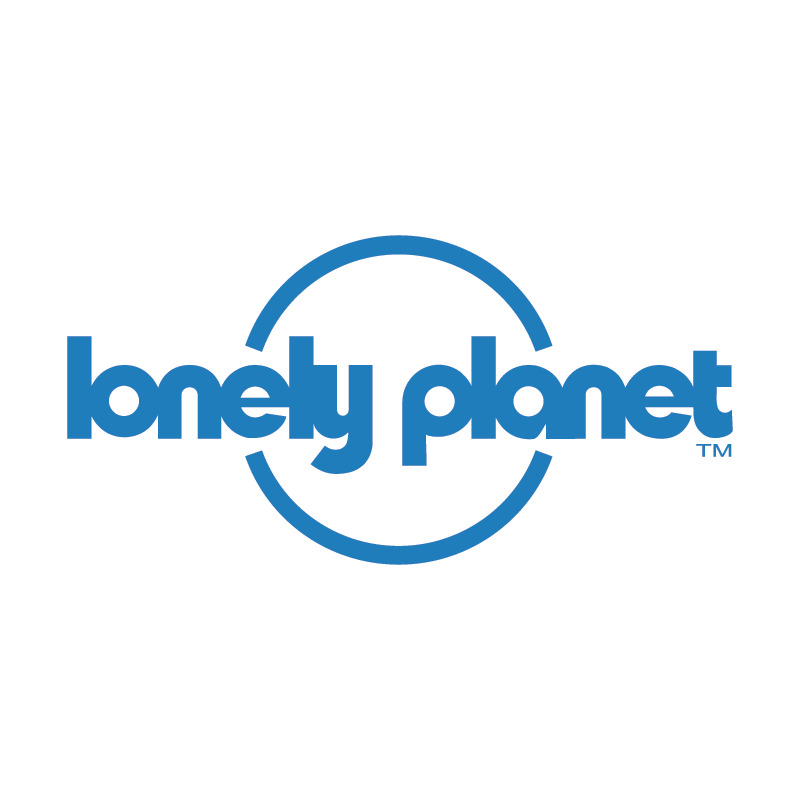 You can easily hire a car to head into town, use the hotel's shuttle service, or use a ride share app. The city center of Chiang Mai is just about 10 minutes away, but it’s hard to leave Dhara Dhevi with all it has to offer! 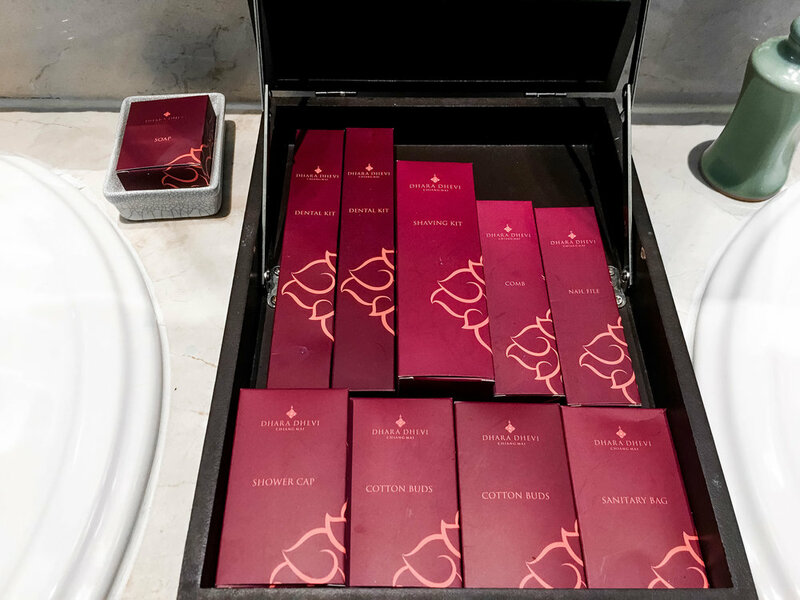 You receive a custom magazine with all the hotel happenings when you arrive in your room. You can refer to this for special things going on, or just head to the concierge for more details. The butler service can arrange for golf carts to take you around the property if needed, but we preferred getting around by bike! Depending on the time of year you come, it might be a good idea to pack some mosquito repellant. This is a tropical area after all! As I said earlier, we only scheduled 4 days in our 2-week itinerary to spend in Chiang Mai (which was clearly not enough), and I wish we would have had scheduled a full week just to spend at Dhara Dhevi. This was, without at doubt, one of the most breathtaking, awe-inspiring, and over-the-top hotels I’ve ever seen in my life. You are never short of an abundance of eye candy when coming here! As sad as we were to leave, we now know that this destination (and hotel) holds a special place in our hearts. We very much look forward to coming back for a quiet, romantic week to spend at Dhara Dhevi sometime in the future. I highly recommend this all-encompassing resort experience when you visit Thailand! Thank you to Dhara Dhevi Chiang Mai for hosting our stay. And a special thank you to all of the incredible staff members who made our visit spectacular. 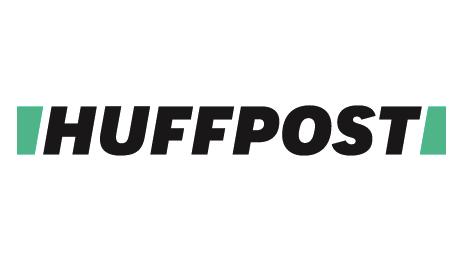 This post may include affiliate links, which comes at absolutely no cost to you. All proceeds go directly back into maintaining this website and making it better for you.All opinions are my own.